Hello crafters! 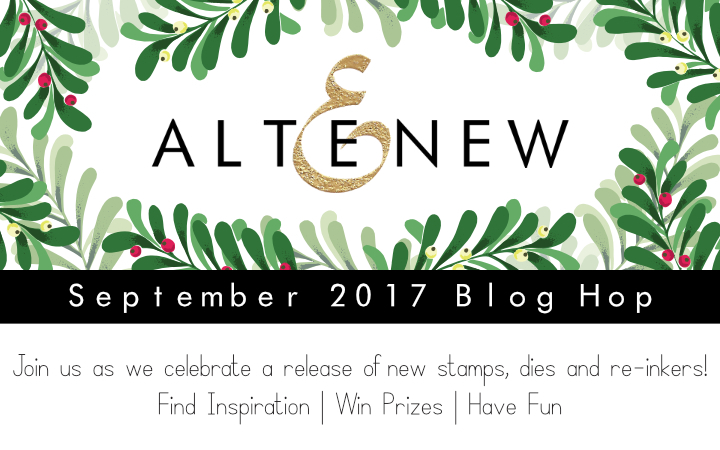 Today is the Altenew September release and I am so honored to be a special guest in their celebratory blog hop! If you have already been hopping along, you should have arrived from my amazing, talented friend May Park’s blog! I made four cards with the new release; all of them feature a pattern stamping technique. Pattern stamping is a really fun way to get a new look with images you may more often use as a focal point or decorative feature. 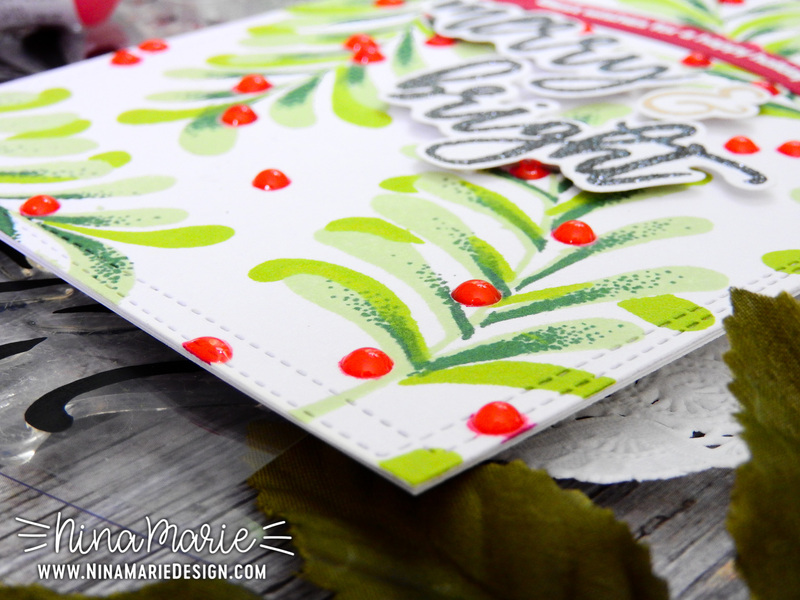 The first card I made features the Majestic Mistletoe stamp set. 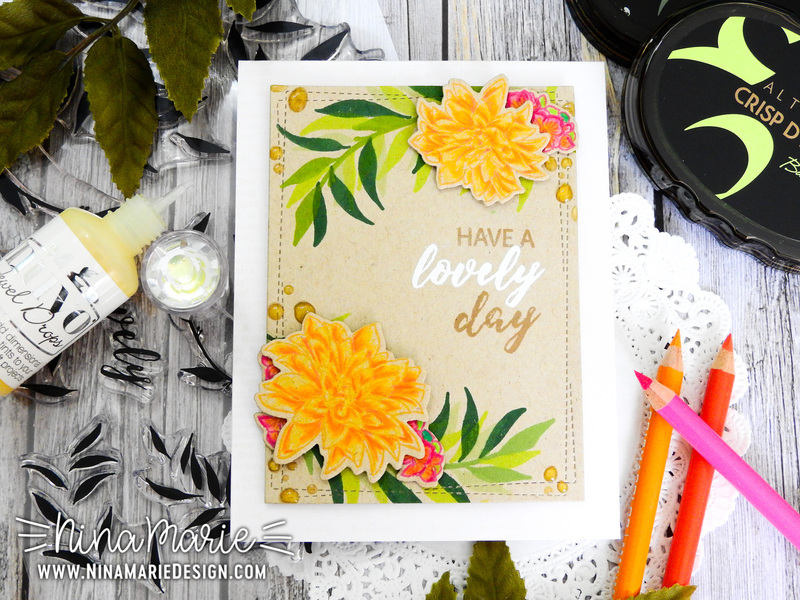 This is a gorgeous stamp layering set that is really fun and easy to work with. I stamped the mistletoe with four different colors of Altenew ink: Frayed Leaf, Olive and Evergreen for the leaves and some Ruby Red for the berries. After stamping the background, I created a sentiment using the new Happy Holidays stamp set (note, in the video I called it Halftone Holidays because that was what the packaging said, but the correct name should be Happy Holidays). The gorgeous black embossing powder is the Tonic Studios Nuvo Glitter Noir; I love how sparkly it is! 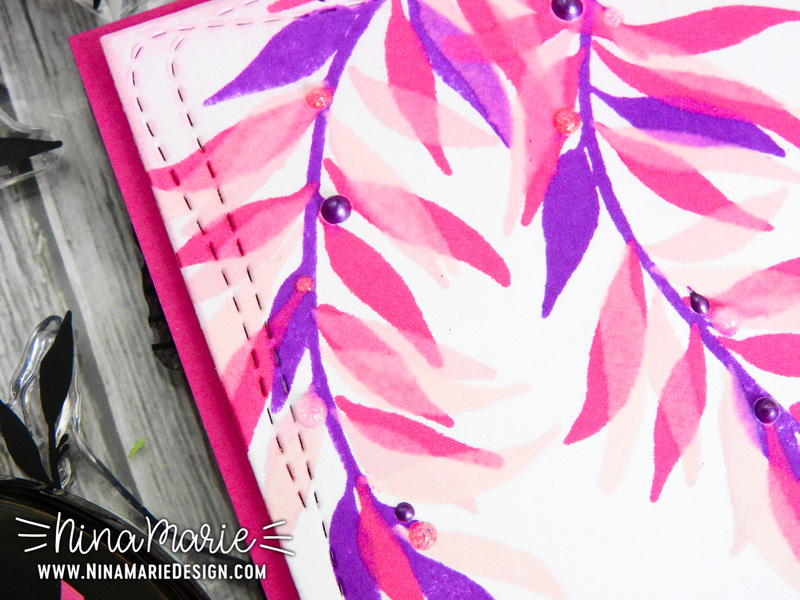 The final finishing detail on this card was the addition of Nuvo Jewel Drops on each berry; for this I used Strawberry Coulis. The translucent, red tones of the drops once they dry are simply stunning and so bright! 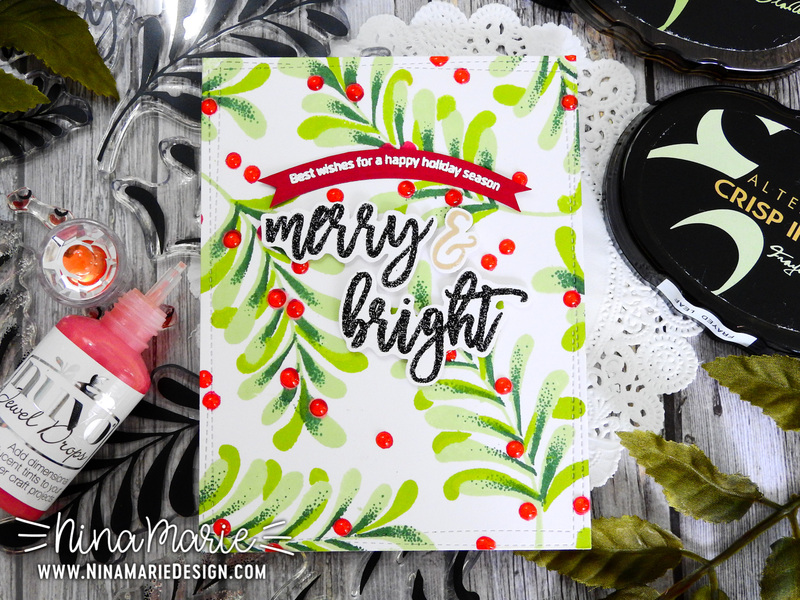 The second card I made features only the awesome Happy Holidays stamp set. 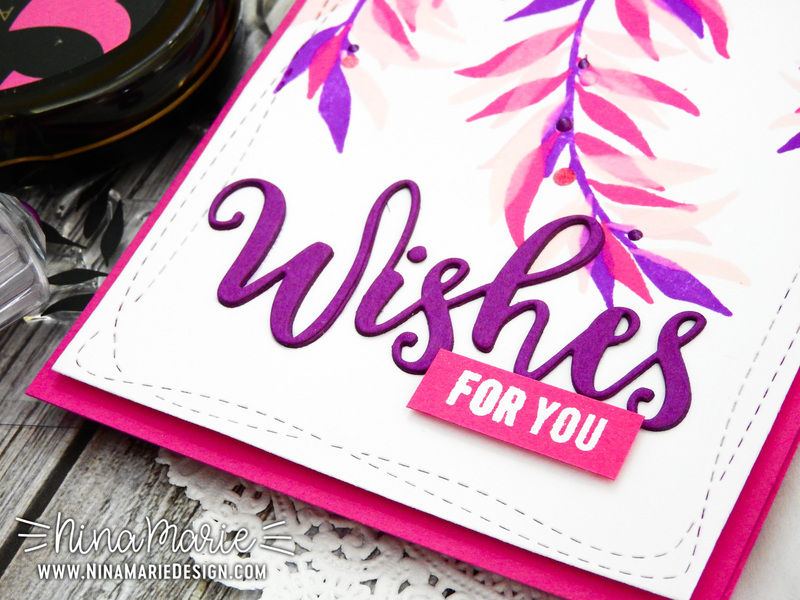 This card demonstrates two very important things: the versatility you can achieve with a singe stamp set and how small images can be built upon themselves to fill a larger space. I used a few Altenew inks to stamp the small images from Happy Holidays: Mountain Mist, Ruby Red, Forest Glades and Rocky Shore. 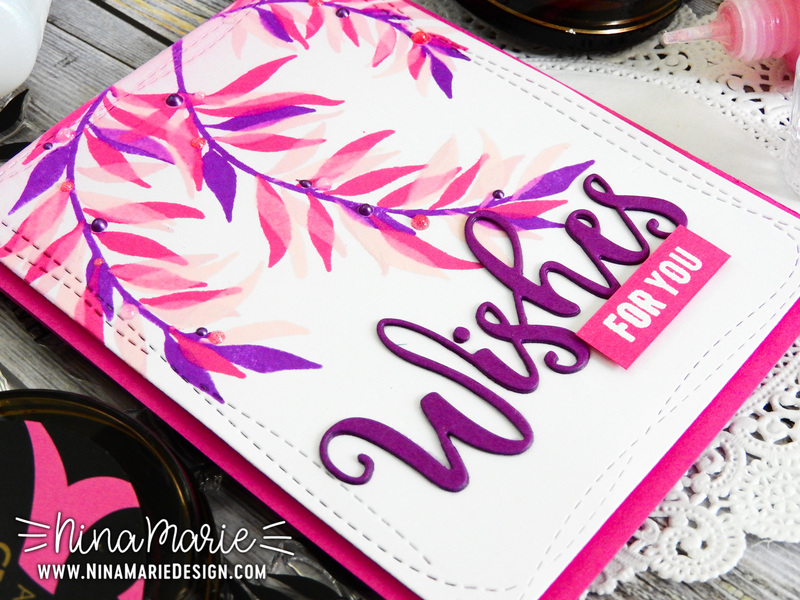 When I stamped the pattern, I made sure to first stamp my sentiment in the center. Because I was going to stamp in a circle, I needed something in the center to be a guide and anchor. From there, I stamped each band of images in a circular pattern until the entire paper was covered. To finish off the pattern, I used some Nuvo White Gloss Drops and added dots in between different images. 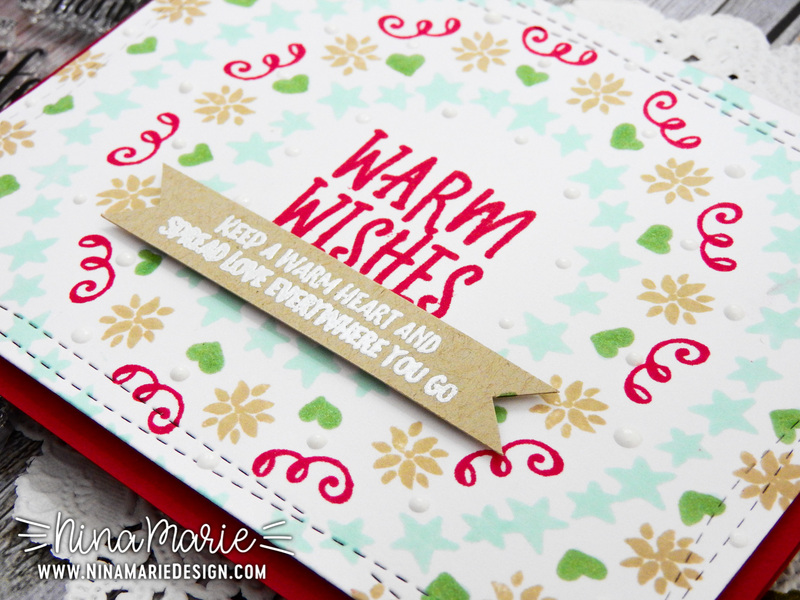 Then I also attached a small sentiment banner underneath the “warm wishes” greeting in the center of the card. 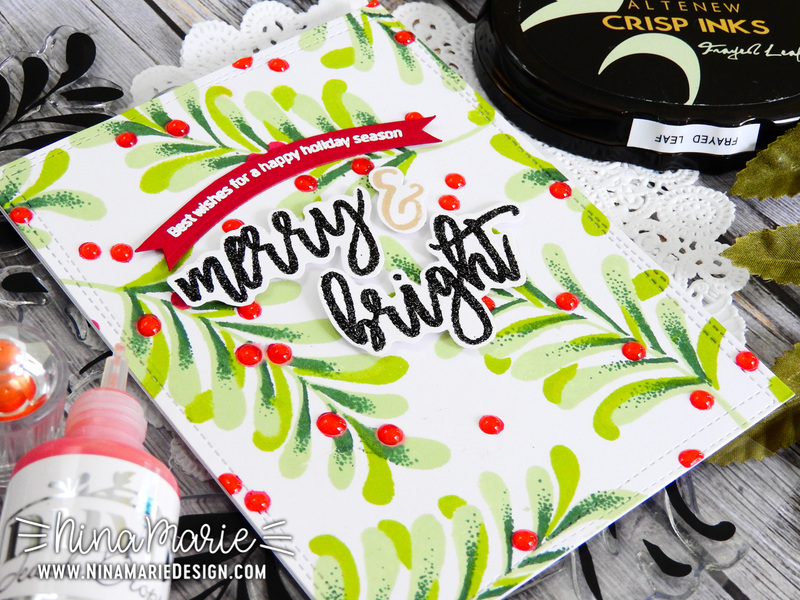 Those tiny image stamps from Happy Holidays take on a whole new look when they are used to make a background pattern! For those of you not yet ready for the holidays, I have two other cards to share that feature some bold colors and florals! 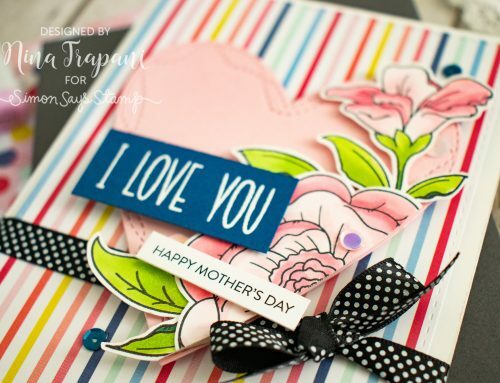 This card uses the Layered Laurel stamp set. 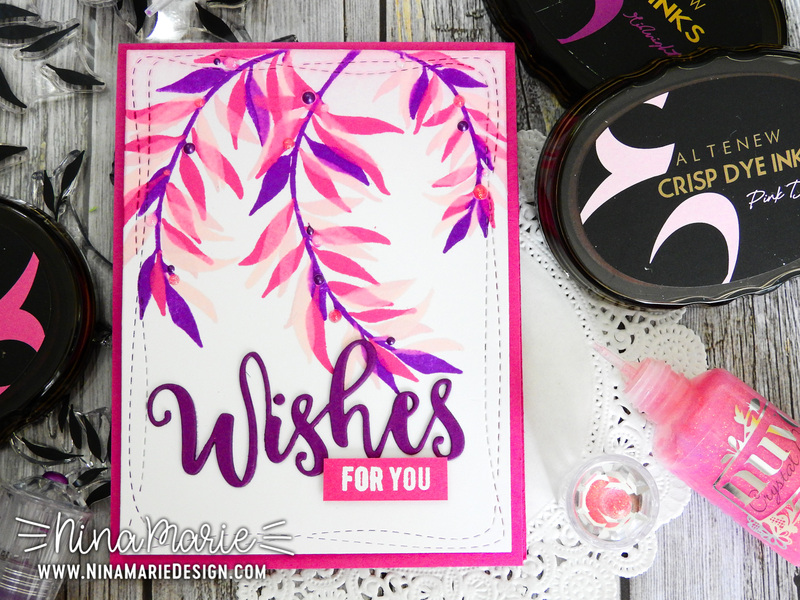 While you can use this set to stamp some beautiful laurels in soothing greens, I decided to go completely crazy and use non-traditional colors! Suffice to say that this card is a little on the psychedelic side! One of my favorite aspects of this particular card is how the lighter inks reacted with the darker inks of the leaf images. Because the Layered Laurel set is a layering stamp set, I wanted to use multiple ink colors to get the maximum amount interest that I could. I chose to use Midnight Violet, Rubellite, Pink Diamond and Frosty Pink, with the darkest colors being stamped first. By stamping the darker colors as the base layers, that meant that the lighter inks were to be stamped over top of the dark colors. When I did this and the inks dried, the lighter inks created “ghosted” effect. 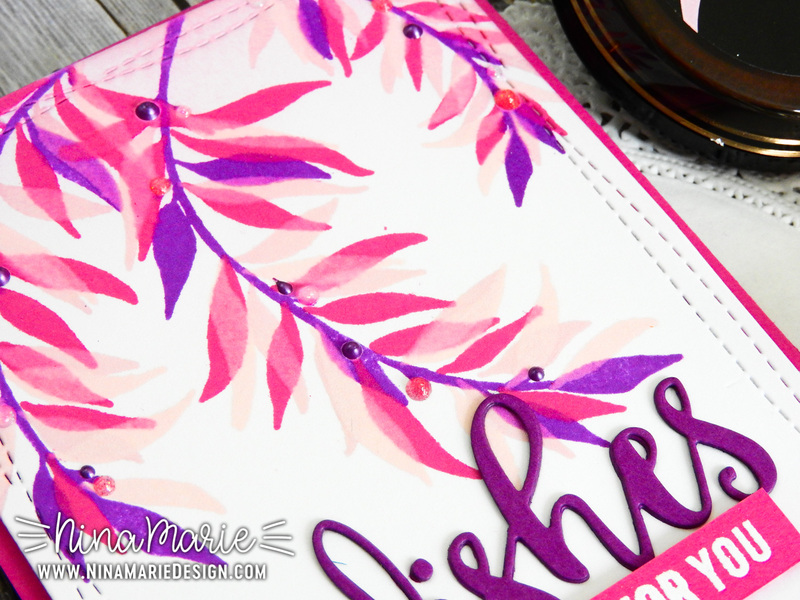 To finish off the card, I added a few Nuvo Drops around the leaves and put sentiments across the bottom of the card using a Holiday Script die and Altenew’s Bejeweled stamp set. For my last card, I went with a more “tropical” approach to the Layered Laurel set. 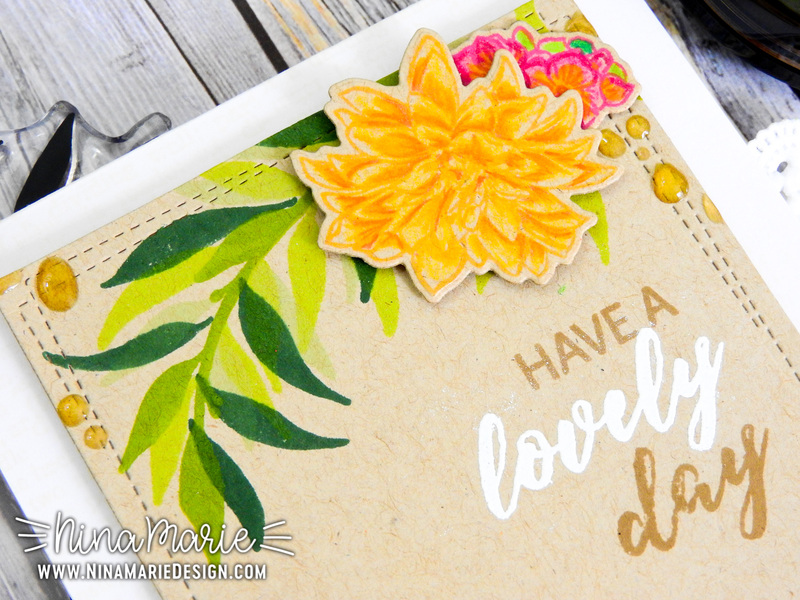 I did all of my stamping on Neenah Desert Storm cardstock (for a more natural feel), and again made use of many Altenew inks; in this card I used Frayed Leaf, Bamboo, Olive and Evergreen. 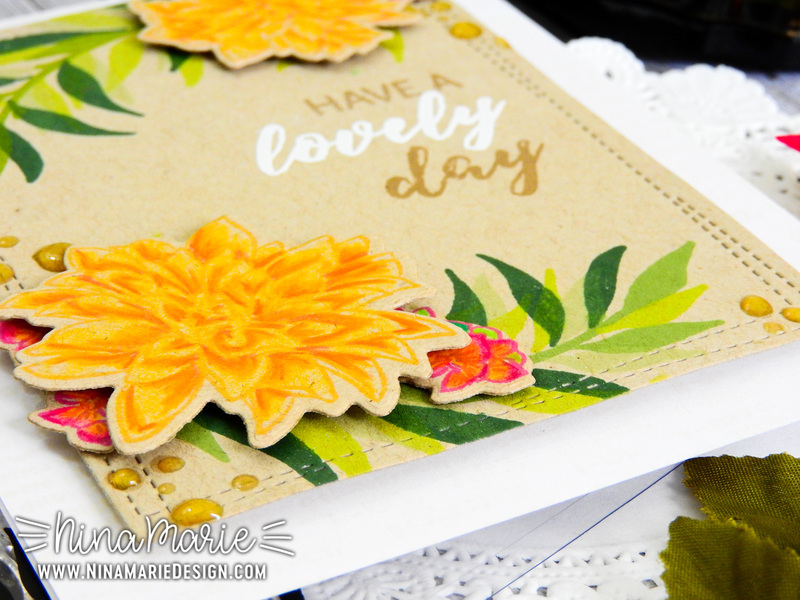 Those beautiful flower images are from Altenew’s Blooming Bouquet stamp set and worked perfectly with the tropical coloring of the leaves. Because those flowers were outline images, I used some Prismacolor colored pencils to add color and shading. For the sentiment, I used a few of the greetings from the Layered Laurel set and stamped those along the right-hand side of my panel. I wanted to draw out some of the white in the sentiment by using a white card base, but I did not want it to be plain white… it needed some texture. Simon Says Stamp recently released a background stamp called Good Reading, which is a bunch of small, random lines of text. 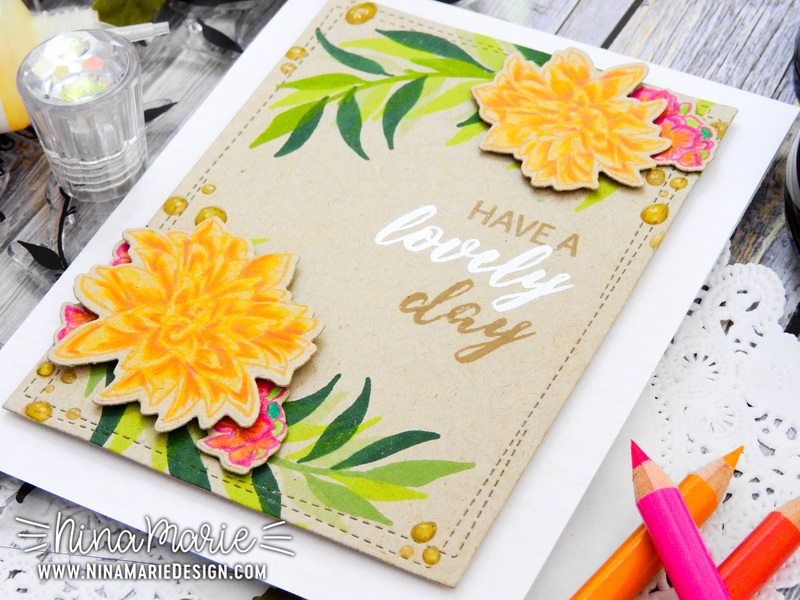 By stamping that background onto the card base with some Barely Beige ink, I was able to achieve the texture I wanted and not distract from the floral arrangements on the main panel. 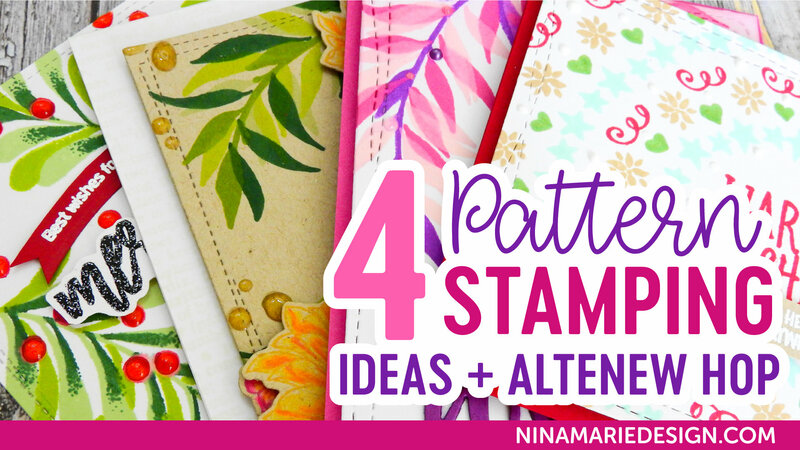 I hope that you enjoyed these ideas for using your stamps to make beautiful patterns on your cards! 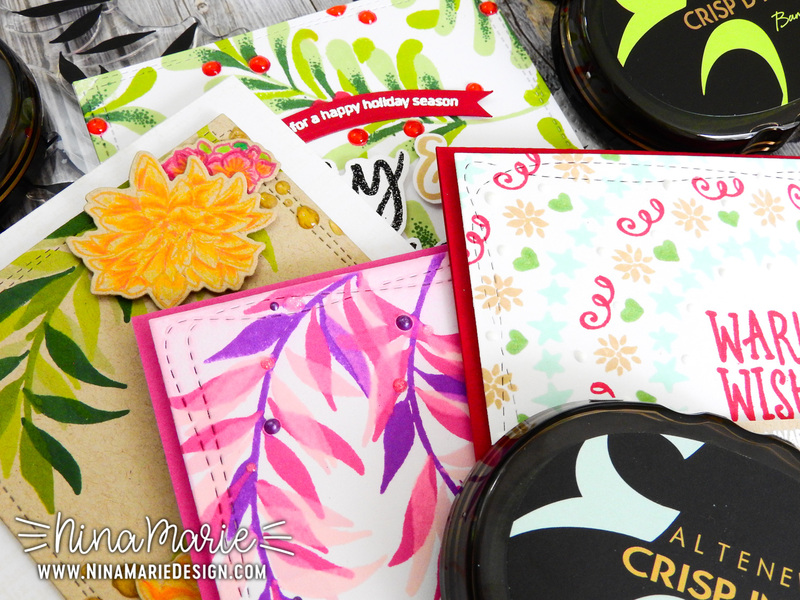 If you haven’t already, be sure to watch the video to see how I made the first card with the Majestic Mistletoe set, as well as the video that showcases all the cards I made, plus the products I used! Altenew is very kind to be sponsoring giveaways to celebrate this release! Altenew is giving away a $50 gift certificate to THREE lucky winners! Please leave a comment on the Altenew Card Blog by Thursday, October 5th at 11:59 pm EDT for a chance to win. The winners will be announced on the Altenew Card Blog on Saturday, October 7th. And as a special giveaway, Altenew is also allowing each designer in the hop to giveaway a $30 gift certificate also! If you would like to win this also, leave a comment on my blog by Thursday, October 5th at 11:59 pm EDT for a chance to win. The winners will be announced on my blog by Oct. 6th. Such CHEERY colours and designs!